Montana is also considered a semi private fence section and is also a neighbor friendly fence. Similar to the Colorado, this section is also board on board but is actually a double board on board section. 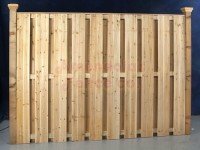 For a more decorative look, add one of our custom wood fence toppers.